Some fashion waves seem to hit London first: think space age prints, hyper-realist detailing, neon lace. The latest one to sweep the city's civilized streets is the coatigan. For those of you not familiar with the term (I wasn't until last week's visit), it's a hybrid of a cardigan and coat--a knit coat. Very slouchy, very comfortable and very perfect for brisk fall weather. I saw them everywhere in London, and every store offered its own iteration(s). 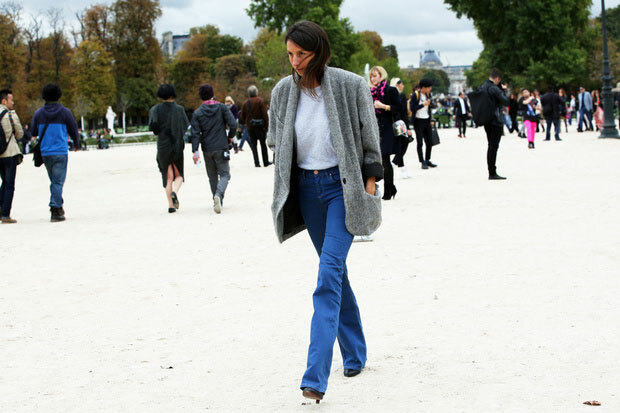 The burgeoning trend seems to be crossing the Channel, too, as sartorially up-to-the-minute women like French Vogue editor and front-row stalwart Geraldine Saglio, above, have embraced them (note her flared jeans!). I love these versions from Topshop, Burberry Brit and Vince. This looks so cozy I am hoping to get my hands on something similar for this season!